A group of San Francisco dog owners has found a unique way to fight back against right wing extremists. 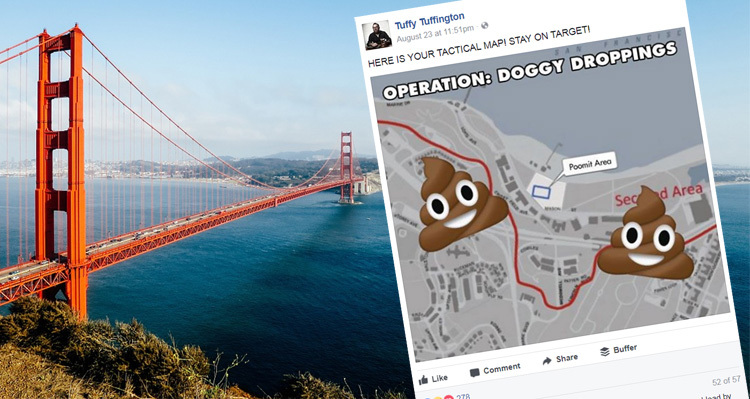 Hundreds of San Franciscans plan to prepare Crissy Field, the picturesque beach in the shadow of the Golden Gate Bridge where rightwing protest group Patriot Prayer will gather, with a generous carpeting of excrement. Facebook user and proud dog owner Tuffy Tuffington told The Guardian that he came up with the idea while walking his two Patterdale terriers. “Watch out for landmines, friends!” the description continues. Currently the page shows over 1K people attending with an additional 5.5K showing interest. Other events and forms of protest are planned as well, according to The Guardian. Shannon Bolt, a behavior scientist who works at Crissy Field, intends to confront Patriot Prayer in the spirit of the Summer of Love. “As white supremacists and neo-Nazis gather in our midst, we’ll tune into the love frequency again and meet their hatred with flowers for their hair,” she wrote in a Facebook event description. There will also be contingents of clowns, kayakers, cars, and kids – all hoping to use their particular strengths (humor, seaworthiness, the ability to monopolize parking spaces, and cuteness, respectively) to thumb their noses at hate. Jones is also “raising money for ten local organizations that reflect the diversity of San Francisco, including the Transgender Law Center, Disability Rights and Education Defense Fund, and Muslim Advocates” according to The Guardian.